Raise your hand if teaching vocabulary is a tad scary for you. Now put it down before strangers think you are losing it! Vocabulary instruction is tricky. We know that our kids need better vocabularies, but actually making it happen is not easy. I have spent quite a bit of time over the past couple of years learning about vocabulary and teaching others how to improve vocabulary instruction in the classroom. I have noticed five common mistakes that teachers are making. Let me preface by saying that I am guilty of every one of these mistakes at one time or another! We are in this together! There are still tons of classrooms where vocabulary is not explicitly taught. Students might be given a list of words or have some sort of center where they work with words. That's all fine and dandy, but that is NOT teaching vocabulary. To truly develop a good vocabulary, students need guided lessons. They need instant feedback and corrections when they are using the words incorrectly. Vocabulary cannot just be something that they do on their own. They need you! There are three different tiers of vocabulary words. Many teachers spend time with tier 3 words during their math, science and social studies instruction. Perfect! That is exactly where those words should be taught. But if those are the only vocabulary words that you are teaching, then your kids are really missing out! The words that they need to improve their reading comprehension and test scores are actually the tier two words. Just because a word appears in your reading curriculum does not mean that it is a word that belongs in your vocabulary lessons. Some of those words are obscure and very specific to that particular story. One story from my reading curriculum was about cowboys. One of the vocabulary words was "chaps." It is a great word to learn when learning about cowboys. But unless they read westerns, students aren't likely to run across that word in other grade level texts. Don't waste your time with obscure words. Focus on words that students will see and be able to use over and over again. This is a pet peeve for me. 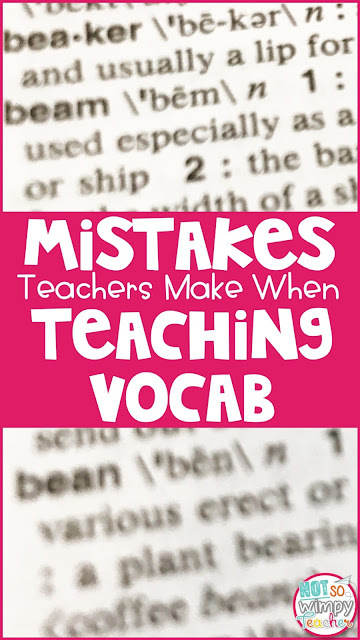 I am so sad when a teacher's vocabulary instruction is simply telling students to look up their words in the dictionary. Words in a dictionary often have many different definitions and even parts of speech. Many of the definitions are very complicated and use the vocabulary word in the definition. Students usually just choose the shortest definition to write down. This is a waste of time, confuses students and teaches them to dislike vocabulary! Please don't do it! I beg you! I remember disliking vocabulary when I was young. It was boring. I didn't feel like I was getting much out of it. If your kids are bored, they won't remember the words that you are teaching. I am not saying that you have to be a circus clown and entertain them with a show during vocabulary. I just think that instruction should mix in some drawing, sharing, games, etc. Make students excited to be word detectives. Make them look forward to this time. 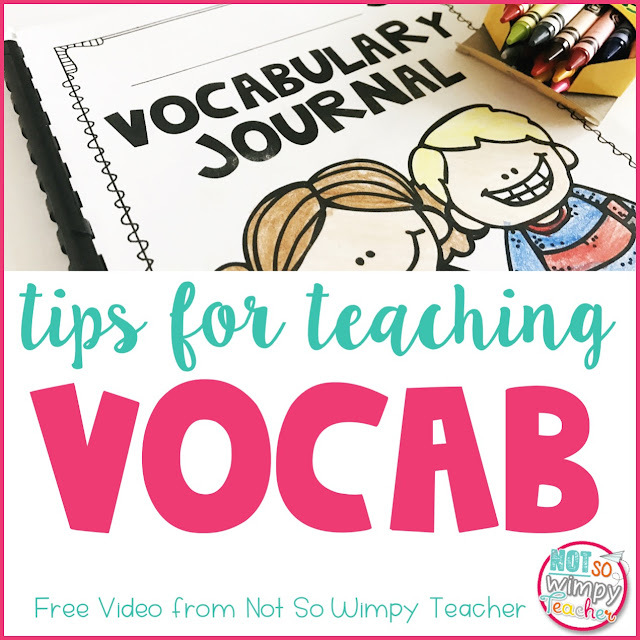 If you are in need of some game ideas, check out THIS post for some fun and free games to play with any kind of vocabulary words. Are you thinking, "Jamie, this is all. fine and dandy. I make these mistakes, but I have no idea HOW to fix my vocabulary instruction!" I am not going to leave you high and dry. I created this FREE video that explains exactly how I transformed my vocabulary instruction into something more meaning fun and engaging. It's so simple!